Recently, I've been spending a lot of my time with my new friend, Yelp. Or www.yelp.com if you haven't discovered it yet, the search engine that will help you find the best wings, donuts, sushi, or whatever you are craving, wherever you are, and however hefty or skimpy your budget may be. On a recent trip, Yelp told me where to find a great bagel in San Francisco (where I happened to also stumble upon the best chocolate dipped coconut macaroon of my life), the perfect Italian meal in the North Beach area of the city, and it told me where to find a stellar, affordable lunch in San Luis Obispo, where we stopped for a bite on the way home. Despite all of the good food I ate in San Francisco (no offense, San Fran, I loved your pumpkin ice cream, tortellini carbonara, and that thick slab of pesto pizza), it was this tri-tip sandwich at Firestone Grill in SLO that practically brought me to my knees. 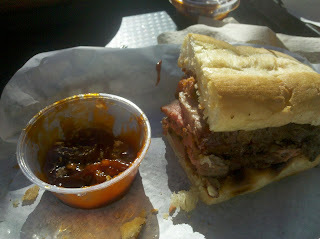 Let me start with what I normally dislike about tri-tip sandwiches. Often times the beef is overcooked, and most of the time it is tough and cut too thickly. Sometimes the roll is too hard, sometimes the meat pulls out of the sandwich as you bite it, sometimes the whole affair is just too dry. But like a modern day Goldilocks, when I bit into this sandwich, I knew it was just right. The soft hoagie roll - generously buttered and toasted - was piled high with thin slices of tri-tip and smeared with a sweet barbecue sauce. The meat was pink, tender, thinly cut, and piled at least ten slices high atop the roll. The sauce oozed out, almost taunting me to hurry up and eat. But I knew better- this was a sandwich to savor. With every bite, I could hardly wrap my brain around the faint crisp of the buttered roll, the texture of the flavorful meat, and the uber sweetness of the sauce. They all sang with a gospel-like amen in my mouth. At $7.99, the tri-tip sandwich was one of the most expensive items on the simple menu of burgers, sandwiches, and salads at this happenin' college student hangout. Sitting outside in the sunshine - after a stretch of bone chilling rainy days braving San Fran's public transportation system with two exhausted little boys in tow - savoring my sandwich and a few crispy onion rings, I was the happiest woman in the world. That is, until I finished the last bite of my sandwich.